I am fair to bursting with excitement over a couple new additions to my art studio that I acquired in the last few months. It’s been a work in progress getting the studio ready for new pieces, and slowly moving the very heavy pieces from my garage up into my studio. A couple weeks ago, I brought the last of the pieces over — after a thorough dusting — and was able to use all the collected pieces to experiment and finally print something. What is it, you ask?! The anchor piece is my new/old 1929 Chandler & Price Proof Press. What a beauty! 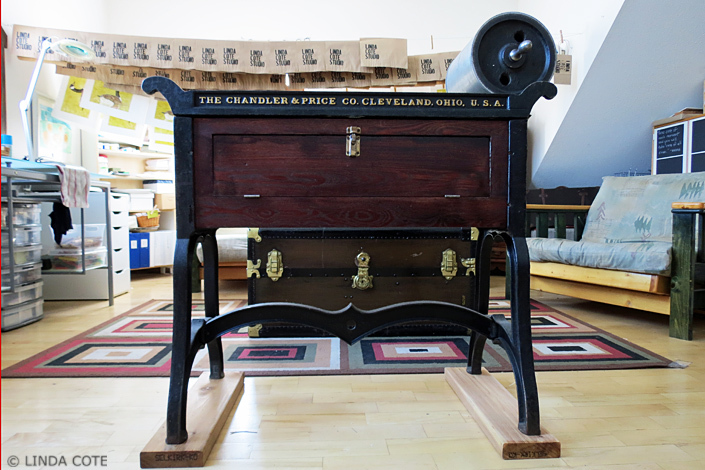 This Chandler, along with a California table and some type, fell into my life in April of this year. Although I have been on the lookout for a press for some time, it remained in the realm of fantasy. 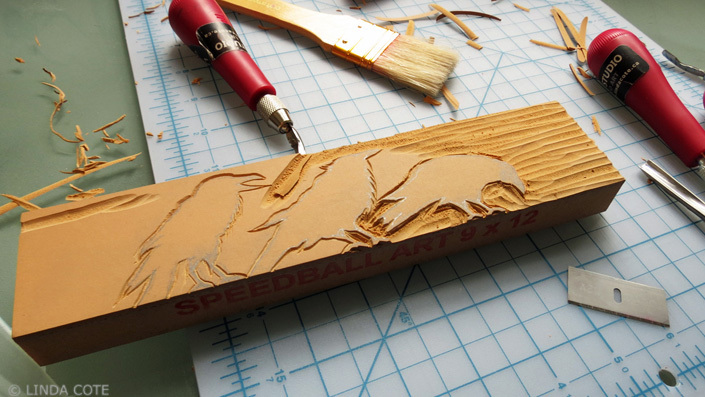 All my linocut printing is done using the hand-burnishing method, without a press. Getting a press seemed like the next logical step in my printmaking practice. However, I have a third-floor studio, and even if I found a heavy antique press and had it shipped to Canmore, getting it up the stairs seemed like an impossible dream. Then, quite unexpectedly, this lovely press, table and a small assortment of metal letterpress type came my way. I heard about it and checked into it, truly believing it was a pipe-dream. The crazy thing was that it belonged to a guy who lived 15 minutes away! This meant no expensive transport to get it, and being a smaller press, I could see a way to get it up the studio stairs … OK, I could see a way for my husband and son to get it up the studio stairs! The moment I saw it, I was instantly in love! The owner had lovingly restored the press, and what a job! 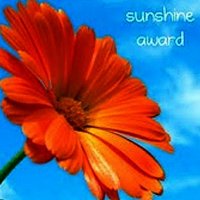 As with any labor of love, he wanted someone to buy it who was as infatuated as he was. I was the lucky (and infatuated) recipient. May I introduce you to my new apprentice? Here, then, is Beulah (the name she came with). 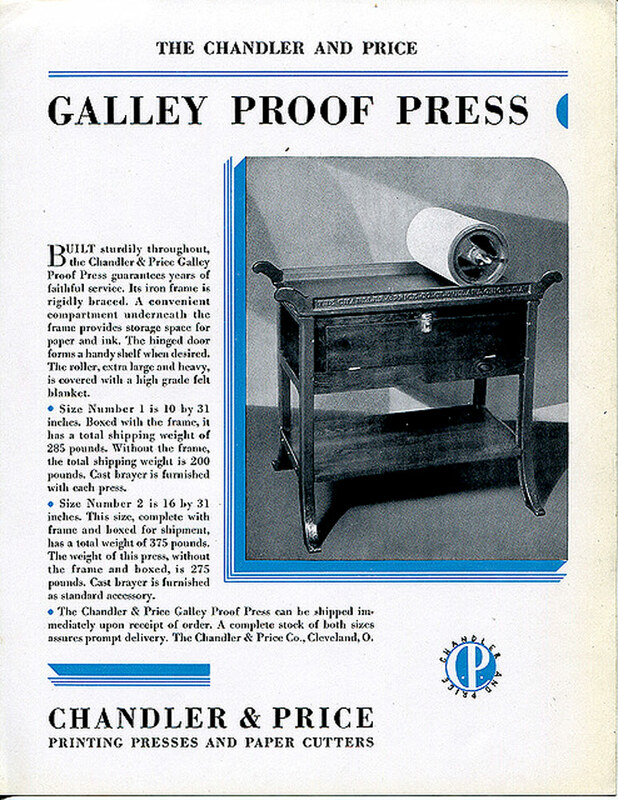 She is a 1929 Chandler Galley Proof Press. The bed is narrow, only 10″ wide x 31″ long. Her bed weighs about 200 lbs, and the roller is about 85 lbs! The holes in the roller are there so you can add up to 50 lbs of sand for added pressure, then seal the holes with corks or wooden plugs. The sand can then be ‘easily’ removed. Her job, in a larger shop, would have been to help the typesetter ‘proof’ the pages in their forms (lock-up) before the whole newspaper or handbill or poster began printing. The smaller press design allowed the printmaker to take a quick impression of a section of type on low-grade paper, check spelling and make any changes before inking up the job and printing it on the larger press. For the initial print run in my studio, I wanted to try something simple. 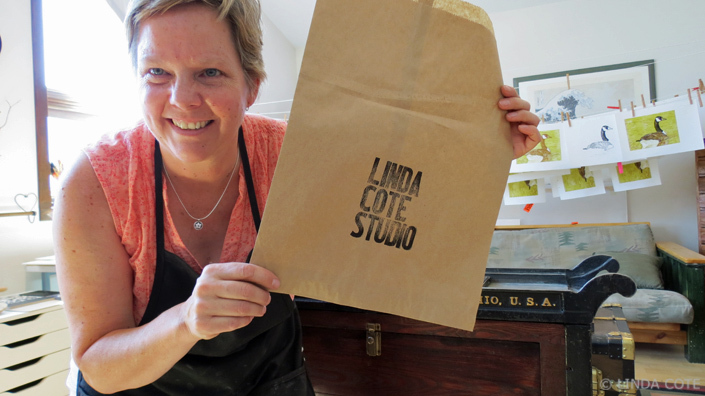 I decided to print kraft paper bags for my upcoming art sales in the fall. I had one drawer of wood type to use, and a great book called Letterpress Now by Jessica White — one of the Ladies of Letterpress — that helped me figure out how to lock up the type in the galley tray. I don’t have a chase for the traditional lock up, but was too impatient to track one down, and just made it work in the galley tray. Those of you who do letterpress for a living, be gentle on me! 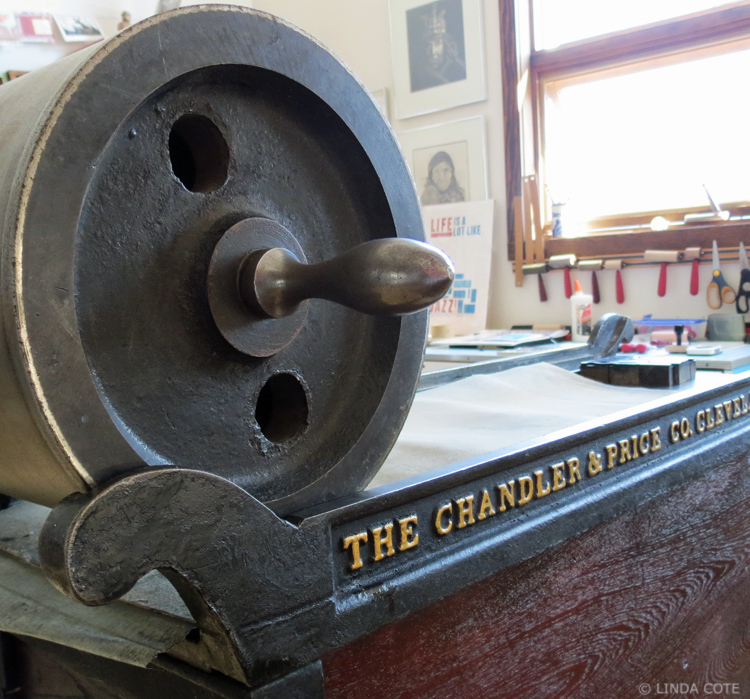 Once in the press bed, all secure, I roll the type using my brayer, just like my prints. Getting the right amount of ink took a little fiddling because the wood type is hard and the paper pretty thin. This was the first pull. Not enough ink, but so exciting! After a number of tries, I seemed to get the right combination of ink and pressure. 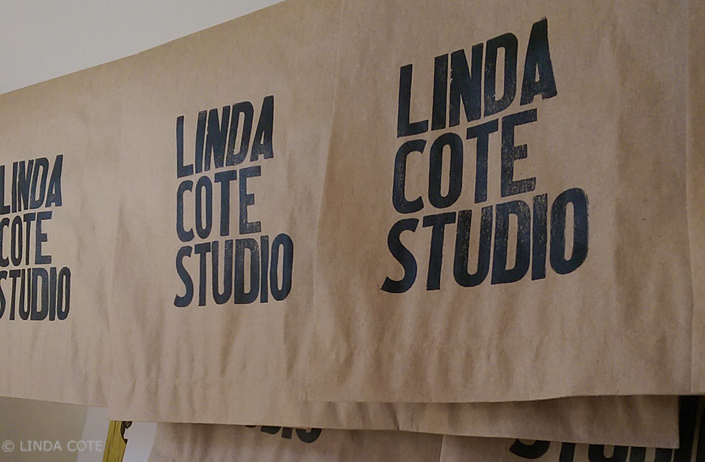 Bags started piling up on the drying line in my studio. I printed about 30 bags all together. Not a lot, but so much fun! 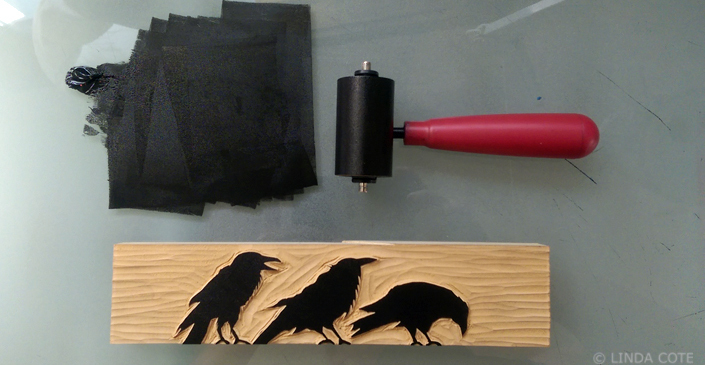 The following week, I wanted to experiment with a linocut along with the type, so began cutting my design, a trio of ravens. The ravens rolled up well, nice and clean. Here is the lock up of the ravens along with the letters. Although the mounted lino claimed to be ‘type high’ it wasn’t exactly the same height as the type, so I packed some mat board under the block to bring it to the same level. You’ve got to expect some adjustments with this handmade process! These were fussier to ink because of the more detailed design, but overall I was super-happy with how they came out. The best comment I got from a friend was: “How much to I have to buy to get a bag?” Haha. For those of you who prefer a ‘live’ look at the printing, this video walks you though the process. You even get to hear the CLUNK of the big roller as it travels to the end of the bed. 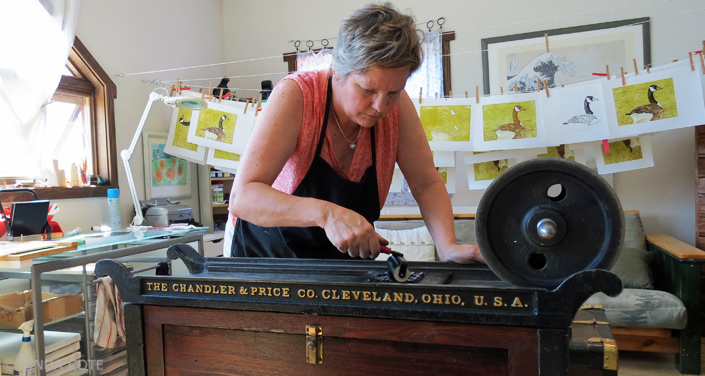 It’s a sound that reminds you that these antique presses were sturdy and build for the long haul. Thank goodness. Very cool. I can’t imagine how hard it was getting the press up the stairs. I’m sure the new equipment will provide lots of inspiration. My husband is such a great support in these endeavors…but I did hear him wonder why I couldn’t take up knitting or something lighter!! Haha. It really has taken my interest in a slightly different direction. Creative detours are always good! Supportive husbands are great. Mine killed a couple of hours this afternoon with our kids in rural Nanton so I could be left to paint at the Coutts Centre. Fantastic equipment – what a find! I’m so jealous of the focus you have in your work. My mind keeps jumping around with too many ideas and techniques, but at least I’m having fun! Looking forward to seeing you and all your new work. Ah, Terri, it’s just in the artist to be interested in many things! That’s why I love printmaking. So many ways to explore within the broader category. To me, your jumping around is so inspiring! I’ve been watching your fabric printing with such interest…another thing on my list! 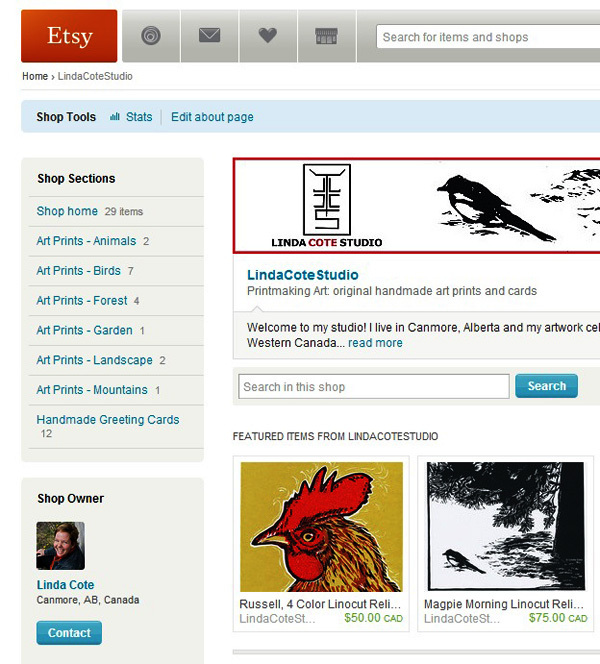 Love it Linda. What a fabulous find. I love those old presses. I had never heard of or seen anything like this one though. Bet you can’t stop printing on it now. So true, Maggie! It’s such a treat just to have it. The fact that it works, too, is amazing! What a beautiful press! I am super envious. Happy printing! This is so exciting !! I have just picked up one of these presses, the owner is moving and her father rescued it from somewhere decades ago. Like you I am expanding into wood block, lino, and drypoint printing so coming across this little beauty was a stroke of luck. The body, box and top tray seem in perfect condition. Maybe a little TLC with TSP to clean it a bit, but the paint looks original and has a wonderful patina, so I am not toching that. The roller needs cleaning and a new felt … any suggestions ?? Hi Daniel – How exciting for you! These are gorgeous presses! From what I found out, ideally, you may need all 3 if you want an impression in the paper (like etchings), but the only one I bought (being frugal) was the catcher. It seems to work pretty well, but to be honest, I haven’t had a chance to print many different projects on the C&P so am just making it up as I go! Here’s a short article on each blanket, and you could google more sites for information, although I haven’t found a ton on the C&P specifically.